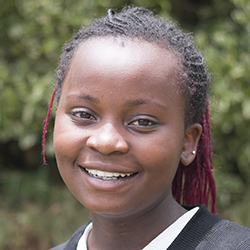 Carolyne is a part of the 2017 graduating class at Uhuru Academy. She has two brothers which, she says, means she gets special treatment at home as the only girl. She lives with both of her parents in Maai Mahui. When she grows up, she wants to be a surgeon or photographer (or both!) She wants to be a surgeon because her mom had four operations, and sometimes they didn’t go well. The services offered at hospitals are not always good, so she wants to help improve them. As far as photography goes, she would like the opportunity to take pictures of wild animals and nature. She notes that the students at Uhuru Academy are privileged because they get to study art, music and French, which are interesting and useful.